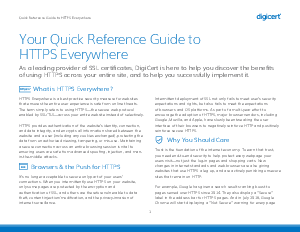 As a leading provider of SSL certificates, DigiCert is here to help you discover the benefits of using HTTPS across your entire site, and to help you successfully implement it. HTTPS Everywhere is a best practice security measure for websites that ensures the entire user experience is safe from online threats. The term simply refers to using HTTPS—the secure web protocol enabled by SSL/TLS—across your entire website instead of selectively. Implementing HTTPS Everywhere on your website secures the user and your organization’s data on every page— from start to finish.